In 1948—49 a small group of Jews of Leicester were seeking an alternative to Orthodox Judaism. In 1950 the Liberal Jewish Group affiliated to the Union of Liberal and Progressive Synagogues, later renamed Liberal Judaism. Initially services were held in members’ homes and hired halls. In the 1960s the name was changed to the Leicester Progressive Jewish Congregation and bi-weekly services were held in the Friends Meeting House until the present building was bought in 1995 and refurbished to become a synagogue. Our building dates from 1885 and was used as school until the community purchased it in 1995. It has been adapted to be fully accessible, a ramp for wheelchairs and a loop system for the hard of hearing. As you can see from the outside, progress on the Annexe continues apace (after a delay due to poor weather and slow arriving supplies). 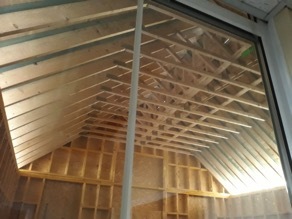 The wall panels & roof are up and work is progressing well on the toilets but right now, the best bit (we think) is the ceiling. The next stage is to select for the builder certain items such as suitable, sustainable flooring, light fittings, signs etc which are covered in the original quote. However, in addition, Miriam is drawing up a list of furnishings so that as many people and groups as possible can get the maximum benefit from the building. 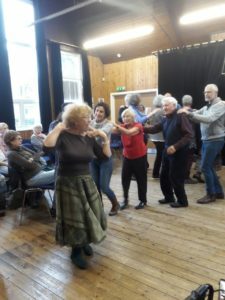 We hope to receive some support with funding for these items but much of the cost will have been paid for by the support by you of the Ceilidhs, Klezmer and summer party events. We will, of course, let you know when we have a date for the grand opening. I know that the builders have tried to keep disruption to a minimum and keeping the pavements clear remains a priority. If you have any thoughts or comments to contribute please contact Miriam as chair of the Annexe subcommittee. This project has been generously supported by Biffa Award, 342 Trust, the Big Lottery Fund and Leicester Progressive Jewish Congregation. We can’t thank you all enough. We have a full calendar of activities and weekly services: Click here to see our services. 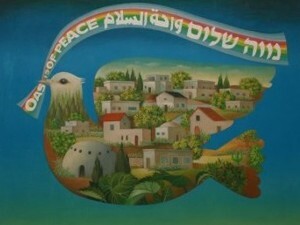 Our community name, Neve Shalom, means oasis of peace and is a tribute to the village near Jerusalem known as Neve Shalom/Wahat al Salam in which Jewish and Palestinian-Arab citizens of Israel live together to create harmony and diversity. The life of that village is a constant source of inspiration and a beacon of hope for peace. New synagogue chairs thanks to a generous grant from a Leicester City Council Ward grant. You may have noticed our fifty new blue chairs in the hall. These have replaced older ones, which were a little worse for wear despite valiant efforts to keep them clean. Whilst our own congregation uses the new chairs, they will also benefit the many community groups that use the hall as well as events that take place there. A congregation member helped to source the chairs at manufacturers’ price (thank you Barry) and a generous grant from Knighton ward covered the majority of the total cost.